I blink at my wristwatch and can’t quite believe it. Against all odds, my flight is going to arrive into Fiumicino on time at 8:45 AM. 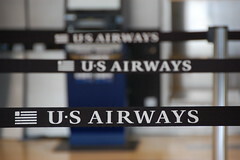 This is a surprise given (in my experience) the general and combined incompetence of Philadelphia International Airport and U.S. Airways. Gratified, but tired nevertheless, I stumble with the rest of the passengers through passport control and then baggage claim before meeting a driver from Rome Cabs, which I pre-booked online some weeks ago. He’s holding a sign with my surname, but it’s preceded by the title “Mr.” instead of “Ms.” My brain is still wakening, so that’s close enough for me. The driver, however, seems genuinely pleased by the slight misunderstanding. He introduces himself as Maurizio and he is a credit to the reputation of Italian men everywhere, charming and flirtatious. Our immediate departure is complicated by my desire to do two things before I leave the airport: buy a Roma Pass and extract Euros from an ATM machine. The first is a matter of convenience, the second of necessity. After all, Maurizio has to be paid. He is, however, remarkably unconcerned about this as he carries my suitcase happily through the international arrivals hall in Terminal C.
We discover that the kiosk that sells the Roma Pass is not yet open for the day, and that the Bancomat across the aisle is likewise out of service. So far, we’re batting zero for two, but Maurizio assures me that I’ll be able to buy a Roma Pass along the Via del Corso easily enough and that there are plenty of cash machines in the city. Not to worry. Somewhere between our stops at cash machines two and three (two simply spit my card out without explanation), Maurizio and a swerving Vespa nearly collide. The guy on the Vespa has some anger management issues and pounds on the hood of the car. Heated words are exchanged, as are gestures that transcend any language barrier. Maurizio assures me that everything is fine and continues to talk pleasantly to me in English as if this kind of thing happens all the time. When at last he carries my bag into the lobby of the Hotel Hosianum Palace on Via dei Polacchi, he slips me his card. He wonders if I might meet him for dinner the following night. I am flattered, perhaps because I know how frightful I look after an overnight flight, or maybe it’s because I am going to mark a milestone birthday later this summer and Maurizio thinks I look young. Nevertheless, I decline and hope afterwards that I have done it gracefully. 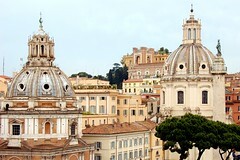 My time in Rome will be short and there is so much to see. I recognize two passengers from my flight, waiting to check in. They introduce themselves as Ann and Mel from Denver and we chat pleasantly for a few minutes while our rooms are assigned. Our itineraries sound much the same, so I wonder if I’ll stumble into them again somewhere in the tourist crowds. When I open the door to my room on the third floor, what I find is small and irregularly shaped, but beautifully appointed and utterly cozy. There is a twin size bed covered in a gold damask spread, a nightstand with minibar, a desk on which rests a flat-panel TV, and a wardrobe for hanging clothes with an electronic safe below. The ceiling is high, framed by an ornate crown molding. 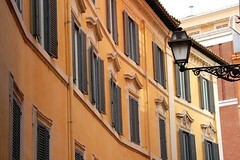 A single shuttered window opens onto a view of the narrow street below. Bellissimo! Once I am safely delivered to the steps of the Victor Emmanuel II monument, I circle around it and climb Michelangelo’s long, sloping steps to the Piazza del Campidoglio. I devour a tomato and mozzarella panini at the museum café under a canopy on the terrace, and enjoy my first sustained view of the city. Afterwards, the museum itself is an unexpected delight. I pop in the earbuds to my iPod Nano and use the audioguide I downloaded in advance from the museum’s website to navigate from one room to the next. 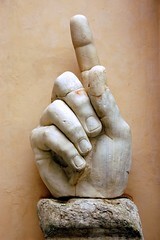 I see Romulus, Remus and the She-Wolf, the famous bronze statue of Marcus Aurelius on horseback, and various disassembled parts from the colossal statue of the Emperor Constantine that once stood by the Colosseum—a disembodied head, a foot, and a hand with the index finger pointing up, like one of those giant foam mitts you see at football games. I can just imagine ancient spectators chanting “We will, we will, rock you…” while watching gladiators and beasts engage in mortal combat. It’s still raining when I leave the museum, but it does nothing to dampen my mood. I am falling in love with Rome already. I walk past the Colosseum, trying to visualize where Constantine once stood in narcissistic glory, then down Via San Giovanni in Laterano to the Basilica of San Clemente. It’s a perfectly lovely 12th century church, with a beautiful apse mosaic, but the layers of history underneath are even better—a 4th century Christian church with remnants of its original frescoes, and deeper still, the remains of a 1st century Pagan temple. From there I wander slowly uphill to San Pietro in Vincoli. Here in a reliquary under the altar are the iron chains that bound St. Peter when he was imprisoned in Jerusalem. To the right is a monument to Julius II, the warrior pope who diverted Michelangelo from work on a more grandiose tomb to paint the Sistine Chapel. Due to declining funds and the pope’s own faltering reputation, the original plans were never fulfilled following his death in 1513, but Michelangelo’s statue of “Moses,” seated at the center, survives. By now it’s late afternoon and the sky has cleared. On my way back to the hotel to rest up and change for dinner, I pause to watch a group of firemen rappel down the face of the Colosseum. It seems like a daring move. Someone in the crowd says that they are practicing for the big “Republic Day” parade, where they’ll unfurl a giant Italian flag. I wish I could be there to see it, but I have a reserved seat on a train to Florence first thing Monday morning. 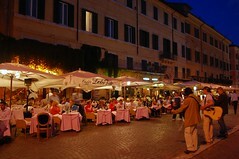 For my first night in Rome, I settle on “La Polarolla” for dinner, near Campo de’ Fiori. It’s 8:00 PM when I arrive and with the time change and the local custom of eating late, I’m starved. But in my inaugural attempt at Italian dining I find myself drowning in food after just two courses. Antipasti, primi piatti, secondi piatti, contorno, dolci, caffé. How do they do it? The cannelloni is very good, as is the pollo porchettato (chicken with bacon and herbs), but I’m left with no room for gelato, which seems like a grave miscalculation. After strolling around Campo de’ Fiori to walk off my dinner, I linger in Piazza Navona. Bernini’s “Fountain of the Four Rivers” is still under scaffolding, but in the darkness it hardly matters. With half flood lit, it’s still an impressive sight. I look around and see artists selling their wares and street vendors tossing glow stick rings high into the sky. Three tenors with guitars are singing a rousing rendition of “Funiculì, Funiculà” to the delight of diners at the “Caffé Dolce Vita.” The sweet life. That’s what la dolce vita means, and being here in Rome on this night, with the pulse of human existence all around me, I understand more than its literal translation into English. Maurizio was right. Rome by night is magic.